Frustrated beyond anything with the hectic, stressful life in the large metro Atlanta area and broken hearted over the betrayal of her boyfriend with her own boss and the loss of her beloved dog, Libby Brown decides to chuck the big city life and buy a ranch in a small, secluded township in Wyoming. The first person she meets in the small town of Lackaduck, Wyoming, is her neighbor, rancher Luck Rawlins. 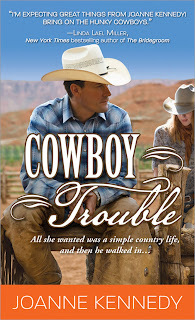 Her first impression of Luke is what any city slicker would think of a cowboy rancher. "Halloween was three months away, but this guy was ready with his cowboy costume. Surely no one actually wore chaps in real life, even in Wyoming. His boots looked like the real thing, though; they were worn and dirty as if they'd kicked around God-knows-what in the old corral, and his gray felt Stetson was all dented, like a horse had stepped on it. A square, stubble chin gave his face a masculine cast, but there was something about his mouth that added a hint of vulnerability." A friendship forms quickly between Luke and Libby, and so Luke is taking Libby to the local watering hole and introducing her to several of the town's people. The bar owner, the cook, the local taxidermist, and Luke's main rival in the small town, Cash McIntyre, the sheriff. Needless to say, the sheriff made his own impression on Libby. "This guy was no Bubba. He was tall, at least six-five, and looked like a California surfer, with blond hair and pale blue eyes set in an angular face bronzed by the Wyoming sun. Luke was nice to look at, but where Luke was spare and wiry, this guy was solid muscle, with Gold's Gym biceps and broad shoulders that tapered down to narrow hips. This whole package was wrapped in brown sheriff's uniform, topped off by a shiny, star-shaped badge that reminder her of a bow on a really nice birthday present. If looks counted for anything, Lackaduck's sheriff would catch every criminal in the county." After being introduced to much of the town at the local bar, Libby soon discovers the town has been looking for a missing teenager. Della McCarthy has not been seen nor heard from in almost two years. Intrigued by the story of the missing girl, Libby's experience as a investigative criminal reporter with the Atlanta Journal-Constitution proves helpful as she begins to dissect the case piece by piece. But as the pieces of the puzzle slowly begin to fall into place, Libby wonders if she has become friends with the Della's murder. Could Libby's sweet neighbor Luke have killed the young girl? Did the sheriff know more than he was saying? Was it possible for a mentally challenged townsman be to blame? All Libby knows is that she is definitely in Cowboy Trouble. Joanne Kennedy has done a wonderful job with her debut novel. This book is filled to the rim with everything -- intrigue, murder, humor, love, quirky characters, and a litter full of little puppies. It has renewed my love for the modern day cowboy love story! I'm looking forward to Joanne's next book, One Fine Cowboy. I love a good western contemporary, Buffie. Great review! I'll have to check this one out, Buffie! Andrea and Gannon, it's a really good read full of intrigue!